Helping the U.S. clean for over 100 years! Do You DIY? Use the Right Cloth to Make Your Projects Perfect and Lint-Free! Have you ever taken on a DIY project such as sprucing up an old piece of furniture or repainting your walls but wound up having bits of fuzz and dust in your paint job in the end? It can be incredibly frustrating to paint a piece so perfectly only to find all of those particles stuck right on top of your handiwork. 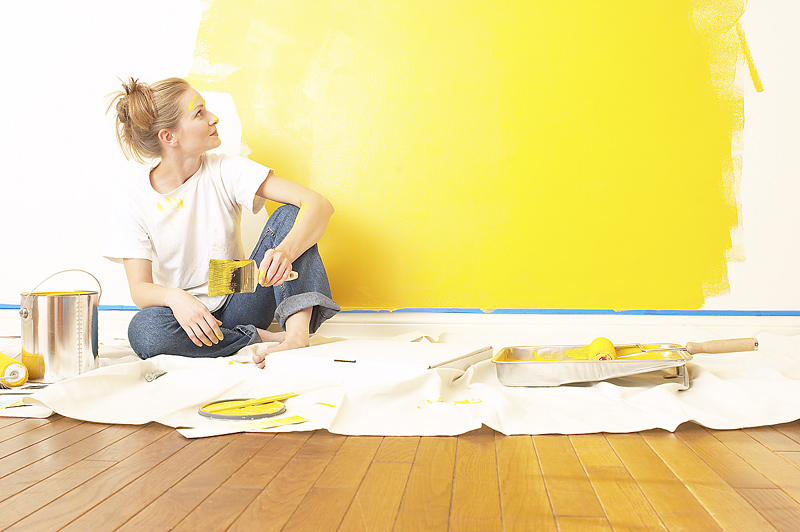 When it comes to painting an assortment of things, you need to make sure that you prepare the surface properly. Failing to do so will diminish the quality and durability of your paint! The best way to do that is with the right cloth or rag, which will typically be a smooth cotton rag devoid of texture. The right rag will clean the surface without leaving behind any dust or fuzz, making your project look perfect! Find out which cloth is the right tool for the job below! For Interior Walls – You want to make sure that your walls radiate with the colors that you choose and are lint-free. That’s why the best tool for the job is the trusty tack cloth! A lint-free tack cloth or even a cheesecloth tack cloth will work wonders on your walls, taking up all the dirt and dust with every swipe so you’ll have a clean wall to paint. For Automobiles – When you’re painting something high-tech such as an automobile, you’ll need to make absolutely sure that your surface is clean. For this job, the lint-free tube is best in preparing the surface for painting. Our tack rags are also great choices to use if you choose to paint or touch up your automobile since they are infused with a hydrocarbon resin to help pick up all those pesky particles! For Furniture and Wooden Objects – Wooden objects and furniture can take quite a while to perfect, especially if you want to stain and varnish the piece. It’s definitely worth it in the end, though, especially if you use the right rag to clean all the dust particles after sanding it down. Once again, tack cloth is a good choice to use between coats of varnish to help wipe the surface clean. You can count on it to pick up all the debris left over after sanding, leaving you with a beautifully painted object! For Metal Objects – Want to make your metal objects look the best they can be? Try our lint-free tubes! Their smooth finish will help eliminate any kind of lint that might be present on the metal. Our tack rags are also great for preparing the metal surface for painting. Both cloths are made from 100% polyester and help you get the job done right the first time! Are you ready to start DIYing? Before you pick up a paintbrush, be sure to visit U. S. Wiping at www.uswiping.com! We provide a huge assortment of cloths and rags for nearly every job. Find your perfect match today and get started! Want to Avoid Those Lint “Fuzzies”? Read About the 3 Levels of Lint-Free Products! It’s spring, and you know what that means – it’s officially car-washing season! But don’t you hate it whenever you’re drying your sparkling-clean car with a certain product that little lint pieces get smeared all over your car? It can be quite aggravating and make you feel as if you haven’t accomplished much! Not all products are like that, though! There are some types that will produce more lint than others… and there are some that will barely produce any! Here we will show you the three different levels of lint-free products. Check them out below! When you think about the levels of lint and being lint-free, it all begins with the material. Cotton, for example, is made of many fibers that are spun into a yarn, and it is a natural fiber. By its nature, cotton is not lint-free; however, it is very absorbent! With that in mind, depending on how they are knit, some cotton rags can actually be more lint-free than other materials! The tighter the knit is, the less linty the material will be. A good example is comparing a bed sheet and a sweater. The bed sheet is much more tightly woven, so it will be way less linty! The next level up on the lint-free ladder is blended materials. Microfibers are a perfect example of a blend. Microfiber is made from 80% polyester for less lint and greater strength and 20% polyamide, a.k.a. rayon, for absorption. This helps the material produce less lint while being more absorbent! Finally, on the highest part of the lint-free scale are the synthetic fibers such as polyester, which is a solid strand that liquids cannot penetrate. Unlike cotton, which can absorb in, on, around, and between the fibers, polyester catches liquid in between its strands. Since the material is a solid strand, it’s very lint-free! We at U. S. Wiping provide a large array of wiping materials for you to take advantage of, no matter what it is you’re cleaning. You’ll find a huge assortment of cottons, blends, synthetics, and other materials for you to use at our website. Check out our products – we’ve been serving the nation with superior products for over 100 years!